As an educator for the past 10+ years, fall always signified new beginnings, new friendships and new clothes! I don't exactly have new clothes but thanks to last night's stormy weather I was able to whip out one of my favorite jackets for my morning walk with the boys. Truthfully it was more for mosquito protection than a fashion statement but every moment is an opportunity to make a fashion statement right? Of course a striped tee is essential for a sea lover like myself. Lastly, I don't think I will ever be able to stop wearing friendship bracelets. They remind me of my schoolyard days and the excitement of making my own design. Did you ever tape the string to your desk and knot away hoping your teacher would not catch you? I did! As you guys know I do get on my DIY kicks here and there, including last summer . Yesterday, I had the intentions of baking my first pumpkin pie but I got overwhelmed. Today's cool start to the day is the motivation I needed to get baking. Oooh! Love that outfit! I've seen that jacket before.. Do you know Gentri Lee? I think she has that exact jacket. Look her up! love how you paired it with the polka dots! LOOOVE! Lol! love the bracelet and I remember making friendship bracelets in Jr high! I'm ok with you ending a sentence with a preposition, if you forgive me when I do! :) I know my grammar, but I don't always use it on my blog. You are beautiful, I love your pictures, and I LOVE friendship bracelets. Awww, good school day memories for me too. I'm off to watch some news and drink some coffee, and relax. i love your fall look! fall clothing is fun. it is hot here one day, and then a little chilly the next. it is weird. but maybe fall will settle in soon so i can start wearing boots and sweaters already. love your jacket & your photos! i don't remember making friendship bracelets at school myself but i have taught kids how to make them in my work as a teacher. Preposition...or not...I love your style! You look GORGEOUS!! Love the outfit, hair, everything!! 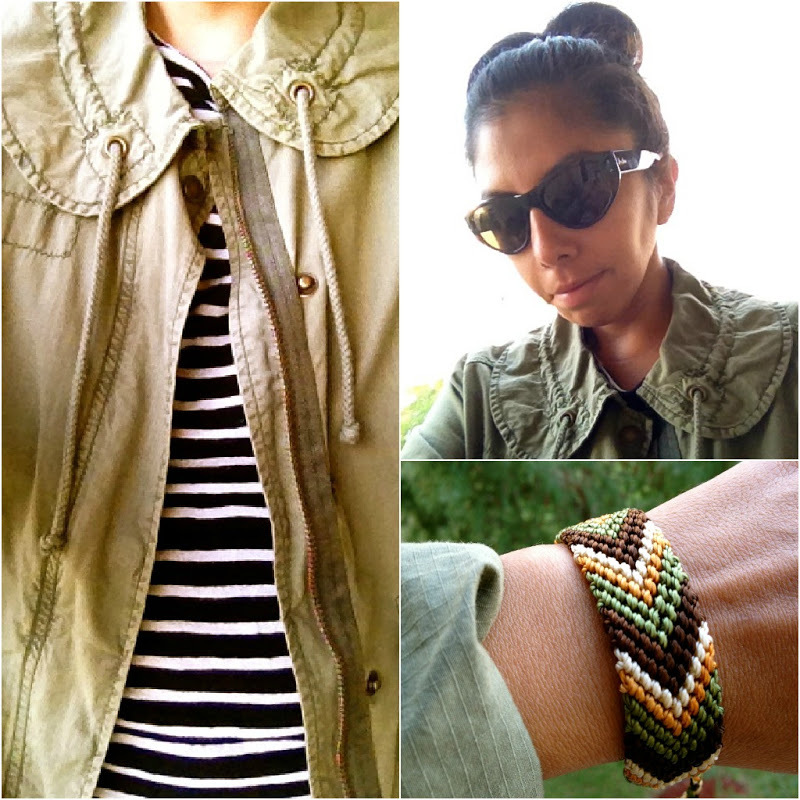 Inspiring me to break out my military inspired fall jackets and do this exact look. Now where did you get that friendship bracelet - its really perfect! !